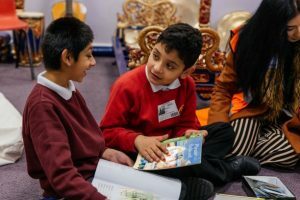 The Story of Embedding Active Citizenship and Social Action across Lapage Primary School, Bradford. Lapage Primary is a large three form entry primary school in Bradford. The school has recently embedded social action across all year groups led by a teacher, Mariya Mobeen, Year 5 teacher and Social Action Lead with the full support of the school leadership team. The vision was to create age appropriate active citizenship that was embedded in the school curriculum, meaningful for every child and sustained. The journey towards embedding active citizenship across Lapage Primary and Nursery. We thought about the Early Years Foundation Stage (EYFS) Curriculum and then thought what could we offer reception and nursery children that would build their learning. We contacted the two local old people’s homes. One said no – the old people they serve would not work for children to meet and we were grateful for their honesty. The other local old people’s care home, Silverlea, said it would be fantastic for the home. We had a meeting and a rolling programme was was agreed. Everyone in the Early Years team went down to conduct a risk assessment and take part in the planning. This was important as this meant it was their curriculum programme and they could shape it. As a result, 8-10 children now go at a time and 4 staff accompany them, they are out of school for an hour. Every child has gone at least twice. As a school we see it as curriculum provision rather than an additionality. Children are served drinks. They sing. We take books and simple games with us. The children were a little scared at first, so back in school we led social stories (from the ELKAN strategy), had pictures of what was going to happen and the place they were going to visit and we talked to children about what they will do. We created a structure; all the details were ironed out. It lasted from January to April. All 90 Reception children were engaged and many of Nursery. 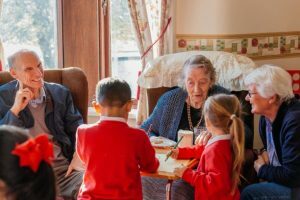 We found that all the older people engaged through either watching the children or reading with the children. The EYFS team have specifically outlined the Early Years curriculum objectives that this opportunity covers for the children. Every three years, ChildLine come to us and do two assemblies. As they don’t charge we thought we could bake in curriculum time, sell what we bake and make money to give to ChildLine. It was a simple idea for which the only tweak was that we had to make sure that we didn’t use ingredients that people are allergic to. We felt this added to something that is already taking place in school and helped the children value things that are freely given to them that are important. We already had connections with Delius Special School. We already have 4 children from Delius who access our shared area in Years 1 and 2. When they visited they would talk and they would play with the other children with the toys available in our shared area. The Year 2 teachers saw instant change and appreciation in their children. We also have children that have specific needs that go across to Delius, so we have established a two – way interaction. Connecting our children is something we have done for a long time, ‘something we do here’. We recognised that Year 2 are a very accepting age and that this was something we could build on for the active citizenship programme. We took a small number of children at a time – initially trialled taking 8 children but that was too many so we reduced this to 4 children with 2 staff. We had to be very flexible to meet children’s needs from both schools and we are grateful to Delius for being so accommodating. Our outdoor learning teacher launched this programme at the start of the year so that all classes were gardening. We linked with Dixons Marchbank who are our neighbouring school, sharing a gate and a car park but part of a different Multi Academy Trust. 4 children from each school worked with Matthew our Outdoor Learning Teacher and another adult from Dixons Marchbank. Those children became expert gardeners together. We felt that we were all coming in through the same gate – too often schools that are very close by can become rivals – but let’s build something different. Each of the three Year 4 classes are linked over the full school year with other Year 4 class in a school with a different pupil population. Through the year they write to one another, exchange curriculum work with one another and meet face to face, first at a neural venue in the Bradford District then visiting one another’s’ schools practising the skills of hosting and visiting. The programme supported by The Linking Network helps develop children’s’ sense of self and their relationships and social schools relating to other children that they would otherwise not meet. The year is structured using four questions ‘Who am I?’ to explore identity, ‘Who are we?’ to understand diversity, ‘Where do we live?’ to promote community and ‘How do we all live together?’ to champion equality. This was something we were already involved with that fit perfectly into our active citizenship programme. Building on from the Bradford Cathedral links we had contacted Gillian at the cathedral to let them know we would like to make connections and work with them. They were working on a Cathedral Heritage Bells Project and wanted school’s involvement. They made links with the Belle Vue Music Company who came into school in January/February and the children recorded music using hand chimes and bells. Cathedral Education staff led an assembly with all three classes in Year 5 – and then 30 children took part in research. This included them speaking to all the other children in the year group and they did some curriculum work in class. Banners were written about their research. Each child became an expert on a different banner. The children were given the title Heritage Consultants and spoke to visitors. People commented on how much the children knew. 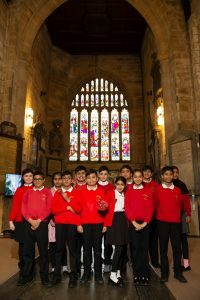 In addition, the children engaged with Refugee Week entering an art competition for the City of Sanctuary award which was launched for refugee week in Bradford. The theme was My Dream and one of our pupils painted the picture that was chosen of a child holding onto a balloon that was lifting them. The idea was entirely his own. We can see ways in which we could develop this further next year inviting refugees and the Friendship Choir to speak to our children in assembly. When planning Active Citizenship for Year 6 the school was aware of the demands of their crowded curriculum but wanted them to have a meaningful strategy. So, they have a basket in Year 6 that children can place food items they want to donate in all year. They are Informed about things needed by the Year 6 teacher, whose brother volunteers at the food bank. As soon as the basket is full the year 6 teacher takes it down to the food bank. This is ongoing for the year and visible all year and is very manageable considering the SATS. Then we also have the Year 6 Real Junk Food project – a whole school initiative led by Year 6. The Sharehouse drop food off to us every Friday afternoon. Every week the food will vary and we all also sell anything made in Food Tech. The stall is set up in the playground on Friday afternoons and we open the gates 15 minutes early. It is led each week by the same teacher with 6 different Year 6 pupils. The school caretaker supports the stall as well and this makes sense as he is on the door at the end of the school day anyway. 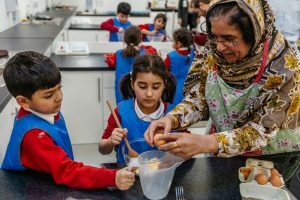 The stall is run as ‘pay as you feel’, and the experience has so many curriculum benefits for pupils – money, change, social skills, economic awareness… It encourages our community with healthy eating. The numbers of parents accessing has grown. One important detail is that the school’s family support worker meets earlier on Friday afternoon to look through the food with any families the school knows to be in dire need such as a family seeking asylum. Keeping the relationships going is at the heart of it – this is easy to say but is essential. The things we chose for each year group built on something we already were doing and then we created a structure to take it to all the children in the year group. We have a strong network in school. People give up their after-school time. We have a very immediate ethos in school modelled by the headteachers. People are so willing to work with children and are behind this idea. There was a real willingness from staff – each team said ‘give us the dates and we can get on with this’.Each one of the projects has depth and a real reason. We believe this helps us build life skills and feeding into citizenship. We need a new Year 5 project as the Bells Project is complete. We would like to celebrate what we have done and make parents and children more aware of the structure of learning ways to be a citizen. We would love to make a mini film to share the work. Because everything was ongoing all year we didn’t create a celebration so that would be great to do next year. To carry on next year and adapt our PSHE curriculum so that it thoroughly embeds active citizenship as a key element. with our thanks to Pears Foundation, The Department for Culture Media and Sport and the National Lottery Community Fund for their interest and support for this project to tell the story of the work Lapage Primary School.